“Doing so would be a disservice to the 60 percent of voters who did not vote for my opponent in the primary,” wrote Honda in a piece that could be considered his opening move for what will be an hard-fought rematch with Khanna in November. Khanna won the June primary in the 17th Congressional District by 1.7 percent over Honda, an incumbent who has served the area since 2001. Last month, three members of his campaign team—two related to finances—left following the primary upset. However, campaign manager Michael Beckendorf remains. The Honda op-ed may also hint at a fall campaign strategy that focuses on labeling Khanna a carpetbagger, or, conversely, Honda as a son of the South Bay giving back to his community. Later, Honda contrasts his biography with that of Khanna, who previously ran for Congress in San Mateo and later considered running against Pete Stark in the East Bay four years ago. “When my opponent was moving around, trying out different Congressional Districts to run in, I was in Congress standing up for the civil rights of all Americans, championing a living wage, and fighting for the expansion of health care coverage for all,” wrote Honda. However, Honda’s campaign appears steadfast in continuing a line of attack used since late in the 2014 election equating Khanna with Donald Trump and other Republicans. To illustrate how much the “Republicans love Khanna” strategy will take center stage over the next four months, Honda circles back in the piece to again link his opponent to Trump. The right-wing extremist strategy, however, is fraught with danger. First off, it has been used by Honda since the last months of the November 2014 and an overview of time since then to now shows Khanna has gone from 20 points down in June 2014 to almost 2 points up on Honda. There may also be some doubts over the assertion’s authenticity, too. Khanna has been effective during this current election cycle of showing a more progressive bent. Khanna showing up at council meetings in Sunnyvale and San Jose to back union workers poses a difficult optic for Honda’s campaign to portray Khanna as someone holding water for rightwingers. Previously, this strategy has proven difficult to employ in parts of this region where voters are more conservative than the demographic data suggests. In the nearby 15th Congressional District, 40-year incumbent Pete Stark attempted to label his challenger Democrat Eric Swalwell as having Tea Party tendencies. One infamous mailer showed Swalwell wading in a cup of tea. It fell flat with voters and maybe energized the Tri Valley’s moderate and conservative voters to back Swalwell. Stark also belittled Swalwell’s youth by calling him a “Bush leaguer.” That didn’t work either. The reason? It wasn’t Swalwell’s inexperience or even his political persuasion that bothered voters, it was Stark’s boorish behavior. With Honda, voters may have showed last June that they don’t care about where Khanna’s campaign contributions come from, but whether Honda committed an ethical lapse of judgment. As it stands, Honda’s pending ethics investigation is included in every single story written about this race. It’s the only conversation voters are having and it already cost Honda the primary. Posted in CA17, congress, Eric Swalwell, June primary, Mike Honda, November election, OpEd, Pete Stark, progressives, Republicans, retirement, Ro Khanna, upset. Bookmark the permalink. Wow. Talk about angry. Talk about desperate. I am so surprised by the tone of the op-ed. This is almost as bad as Honda's victory “crow” speech he gave after the 2014 general election. That speech did more to propel Khanna forward than nearly any efforts his own campaign did this cycle. I can only imagine how this op-ed will fare. Khanna is highly likely to win by >10-15 points because of the nature of the top two system. It's just sad that Honda is being led by a comms director (Vedant Patel) and campaign manager (Michael Beckendorf) who are not very experienced and, obviously, out of their league. A polished political operative (like Doug Greven) would never have done this….I guess Honda wants to go out in flames rather than gracefully. It's sad that he doesn't seem to care much about preserving his legacy. His remaining staff certainly don't seem to…. 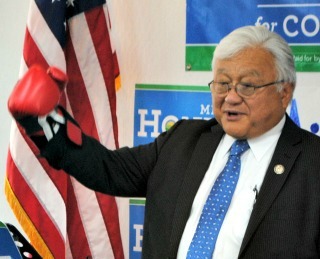 Thank you Steven for correctly analyzing Mike Honda's response to calls for him to retire. If people haven't realized already – this should cement the fact that Mike Honda has lost it. Either he is mentally too fragile to see the writing on the wall and truthfully analyze the reasons for his failure or the folks around him have been feeding him some serious lies. He has been ranting about the same old tired things since 2013 and the voters each time have punished him by progressively reducing his margin in each election until now when he ultimately lost. With majority of the registered Democratic voters decisively siding with Mr. Khanna, Mr. Honda's claims have been proven hollow and deceitful. His claims that 60% voters voted against Ro Khanna, while technically true are laughable – and I guess he should win the Nobel for this discovery and also for conveniently failing to state that he's the incumbent who was rejected by almost 63% voters. At the best, this can be a lame and lousy attempt at enthusing his worried supporters and donors but its really not going to cut with the voters. Mike Honda has certainly earned his right to contest the general election due to the same top two primary system that he and his supporters were busy deriding so much in 2014. However, he knows for sure – there's no path for him to earn more 50% of the votes in #CA17 and that he's a Congressman only for next 6 months. Let Honda reveal himself for who is really is over the next few months…it's the only way folks are to accept that a candidate that many see as an opportunist should representative. He'll kick and scream but it's over. It's time to start acting like the incumbent. Honda 2014 speech was rude. So is claiming that a person who got a post office named as a payoff when they didn't. Also, guise, if you're going to AstroTurf make it less obvious…you're not doing anything other than repeating what Tavares has written (which is just a rehash of what everyone is saying) while looking childish and small by engaging in amateur armchair psychology. Rather than voting for Honda so that he can continue “serving” the East Bay with more years of his uselessness and dizziness, instead he should FINALLY retire, and as a going away present we can give him THE ALICE LAI-BITKER “PUBLIC SERVICE” AWARD IN WISHY WASHYNESS AND BEING TOTALLY LOST. How sad is this whole conversation? The Federal Government is $220 Trillion in debt when all liabilities are considered. ISIS is everywhere. Radical Islam is on the move. Interest rates are so low it is impossible to save for retirement…but all you guys can talk about is which of these two guys should be elected so they can take orders from Nancy Pelosi further bankrupting the country. WAKE UP…before it is too late.